Narrated by: Xavier Amador Ph.D. 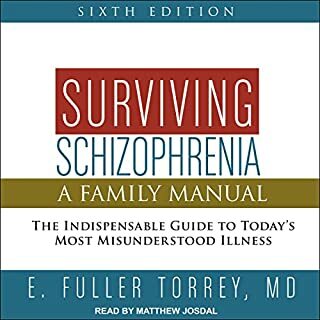 Since publication in 1983, Surviving Schizophrenia has become the standard reference book on the disease and has helped thousands of patients, their families, and mental health professionals. 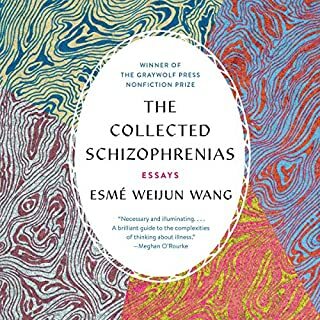 In clear language, this much-praised and important book describes the nature, causes, symptoms, treatment, and course of schizophrenia and also explores living with it from both the patient's and the family's point of view. This new, completely updated sixth edition includes the latest research findings on what causes the disease, as well as information about the newest drugs for treatment. Professor of psychiatry Elyn R. Saks writes about her struggle with schizophrenia in this unflinching account of her mental illness. 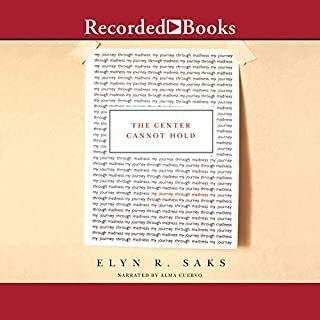 In The Center Cannot Hold, Saks draws readers into a nightmare world of medications, a misguided health-care system, and social stigmas. But she would not be defeated. With a strength and force of will that most can only imagine, Saks reclaimed her life and went on to achieve great success. 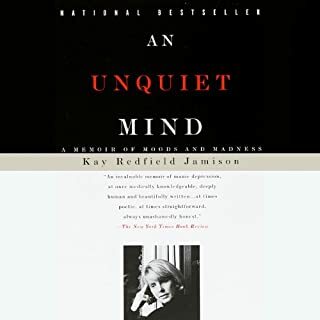 The personal memoir of a manic depressive and an authority on the subject describes the onset of the illness during her teenage years and her determined journey through the realm of available treatments. Schizophrenia has become a recognized psychotic disorder in modern day psychology and research has shown that one in 100 people suffer from this disease in some proportion or degree. It is a dreaded disease and comes as a near death blow to those who are diagnosed with this condition. This fear does not necessarily arise from the scary disease it actually is, but various misconceptions, myths, and misunderstanding that surround it. This disorder has been very thoroughly misunderstood and misrepresented. When readers first meet Ben, he is a sweet, intelligent, seemingly well-adjusted youngster. Fast forward to his teenage years, though, and Ben's life has spun out of control. Ben is swept along by an illness over which he has no control—one that results in runaway episodes, periods of homelessness, seven psychotic breaks, seven hospitalizations, and finally a diagnosis and treatment plan that begins to work. I'm glad I listened to Ben's story! From the centuries of torture of "lunatiks" at Bedlam Asylum to the infamous eugenics era to the follies of the antipsychiatry movement to the current landscape in which too many families struggle alone to manage afflicted love ones, Powers limns our fears and myths about mental illness and the fractured public policies that have resulted. Braided with that history is the moving story of Powers' beloved son Kevin - spirited, endearing, and gifted - who triumphed even while suffering from schizophrenia until finally he did not. Pete Earley had no idea. He'd been a journalist for over 30 years, and the author of several award-winning, even best-selling, nonfiction books about crime and punishment and society. Yet he'd always been on the outside looking in. He had no idea what it was like to be on the inside looking out until his son, Mike, was declared mentally ill, and Earley was thrown headlong into the maze of contradictions, disparities, and catch-22s that is America's mental health system. Schizophrenia: what it is, what the symptoms are, and what to do about it! Schizophrenia is a mental disorder with lots of complications. Although it cannot be completely overcome in the sense that the disorder will disappear, there are ways to cope with and reduce the symptoms. 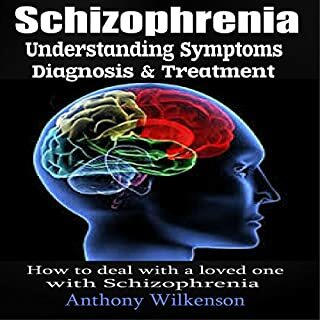 The author has experienced the struggles with schizophrenics himself and relates the information and clinical research to his own experiences with one of his friends. In Troubled Minds Amy Simpson, whose family knows the trauma and bewilderment of mental illness, reminds us that people with mental illness are our neighbors and our brothers and sisters in Christ, and she shows us the path to loving them well and becoming a church that loves God with whole hearts and whole souls, with the strength we have and with minds that are whole as well as minds that are troubled. Compassionate and comprehensive, Dr. Francis Mondimore's path-breaking guide has helped thousands of people and their loved ones cope with bipolar disorder. Now in its third edition, Bipolar Disorder has been thoroughly updated with new information about the causes of the disorder, tools for diagnosis, and advances in treatment. On the outside, Terri Cheney was a highly successful, attractive Beverly Hills entertainment lawyer. But behind her seemingly flawless facade lay a dangerous secret - for the better part of her life, Cheney had been battling debilitating bipolar disorder and concealing a pharmacy's worth of prescriptions meant to stabilize her moods and make her "normal". In bursts of prose that mirror the devastating highs and extreme lows of her illness, Cheney describes her roller-coaster life with shocking honesty. Writer Sandy Allen did not know their uncle Bob very well. As a child, Sandy had been told Bob was “crazy”, that he had spent time in mental hospitals while growing up in Berkeley in the 60s and 70s. But Bob had lived a hermetic life in a remote part of California for longer than Sandy had been alive. Then in 2009, Bob mailed Sandy his autobiography. In A Kind of Mirraculas Paradise: A True Story About Schizophrenia, Sandy translates Bob’s autobiography, artfully creating a gripping coming-of-age story while sticking faithfully to the facts as he shared them. Schizophrenia is an often misunderstood mental illness that afflicts more people than you may think. 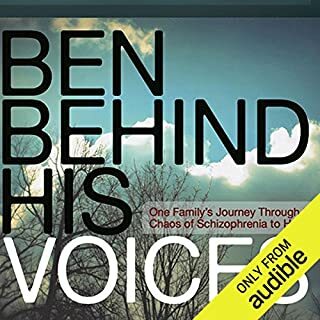 Whether you personally suffer from schizophrenia, or a family member or friend does, this audiobook will help to educate you on the illness, along with its causes and treatments that are available. You will learn about the warning signs and symptoms of schizophrenia, and also the different types of the illness. Most importantly, you will learn how to live with and manage schizophrenia. You will discover a range of techniques and treatment options. Richard Carlson Jr. was diagnosed with paranoid schizophrenia when he was 21 years of age. His illness first manifested when he was an early adolescent. Modern psychiatry greatly failed Richard for over a decade. Then, after an incident involving the police, he truly understood that his diagnosis was real, and finally began the long process of recovery. Over 10 years later, his life is greatly improved. In the course of his treatment, Richard also recovered from depression, obsessive-compulsive disorder, and lethargy. Dr. Amador's research on poor insight was inspired by his attempts to help his brother Henry, who developed schizophrenia, accept treatment. Like tens of millions of others diagnosed with schizophrenia and bipolar disorder, Henry did not believe he was ill. In this latest edition, six new chapters have been added, new research on anosognosia (lack of insight) is presented and new advice, relying on lessons learned from thousands of LEAP seminar participants, is given to help listeners quickly and effectively use Dr. Amador's method for helping someone accept treatment. I Am Not Sick, I Don't Need Help! is not just a reference for mental health practitioners or law enforcement professionals. It is a must-have guide for family members whose loved ones are battling mental illness. Listen and learn as have hundreds of thousands of others...to LEAP - listen, empathize, agree, and partner - and help your patients and loved ones accept the treatment they need. This book outlines a different and seemingly more effective approach to treatment of mental illness. You will better learn the thoughts of the person whom you are trying to help (tormenting) and learn why the traditional approach is futile. Then Dr. Amadaor teaches you how to make his whole program work for you and your loved ones so you can pick up the pieces and move on with your lives. By focusing on common goals and listening reflectively (as opposed to reactively) you can start to put the pieces of your lives back together again. These are principles founded in emotional intelligence and winning other people over to your way of thinking. When you've tried everything else, try this! As an aunty living with and looking after a 22-year old niece with bipolar disorder, I find this book to be a MUST READ/LISTEN for anyone who has a family member or friend wth schizophrenia or bipolar disorder. This is NOT the complete book! I wanted to try audible via the free trial offered. Boy, am I glad I did! I realized only after buying the physical book that audible is not providing the entire “story” (pun intended). There are 20 chapters in the physical book yet only 15 on the audible version. I feel quite gypped! Causes one to wonder if they condense all their books. This is an incredibly helpful book for those who care for or love someone with mental illness. Learn LEAP communication technique an invaluable tool to help someone with mental illness accept treatment, even when the person does not believe they are ill. The book focuses on real life challenges. The author has a unique background one as an expert (a psychiatrist) and one as a family member who understands first hand the daily challenges of having a mentally ill family member; his brother has schizophrenia. Real life experience and professional expertise rolled into one, an invaluable combination. This book is a must have for anyone who lives with or cares for someone with mental illness! Dr. Amador gives incredible insight into what is going on in the minds of those that may be struggling in life with various challenges. 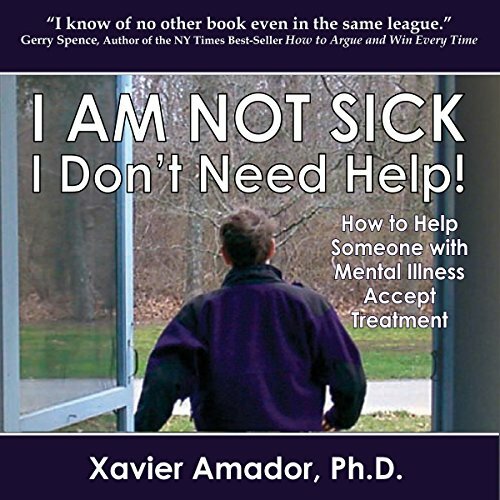 While the book is written specifically in relation to those with mental illness, the communication techniques used and taught by Dr. Amador completely apply to any individual wanting to communicate with anyone and everyone. I have used several of his tips in dealing with my children, husband, coworkers and friends and have found conversations going much smoother, particularly when discussing something challenging. I have even explained them to my husband, so he can start using them as well. It does take time and commitment to get the desired results. If you put in the effort, the results will be what you're hoping for. No longer do I fly off the handle and scream or use sarcasm to get result. And, an added benifit is that my relationships are stronger and better. These are techniques I hope to use forever. one of the hardest things watching my son go through not knowing who he is Or why his brain doesn't think the way it used to This book helps me understand how to talk to him without losing him forever. This book gives me hope. I never realized how wrong I was about my brother. I lived so long in fear and frustration over my brother that I almost gave up until I read this. Thank you. I’m going to read it again and take notes! I listened while driving and wish I could have taken notes for all the great advice. I’ve tried a few of the suggestions already and had a great response. I’m going to suggest this book to be read by all the families in my NAMI Family to Family classes. I think it will be a great help in understand and talking with loved ones. A really interesting look at insight and how to communicate effectively in the abscence of insight. A must for anyone interested with mental health. i just wish the author would narrate his other books. He has an amazing voice, tone and speed. The infomation presented was outstanding and insightful. A must i belive for anyone interested in Mental Health from families to Doctors. Well done. Dr. Xavier Amador thinks people suffering psychosis may experience anosognosia caused by a deficit in brain function related to their disease. It is this deficit which makes them unable to believe they are sick and need treatment. This book is based on his years of clinical experience. In it he provides the reader with a framework for communicating with our "loved ones" who are experiencing psychosis and helping them to accept treatment. While no panacea Dr Amador's framework for communication provides a structured practise for those of us seeking to understand and aid a "loved one" experiencing psychotic illness and refusing treatment.